Got GEOINT? Attendees to the annual GEOINT Symposium will recognize this slogan that appears on the tee-shirts distributed each year at the preeminent geospatial intelligence conference. Produced and presented by the United States Geospatial Intelligence Foundation (USGIF), a non-profit, non-lobbying educational organization, the GEOINT Symposium is the nation’s largest gathering of industry, academia, and government to include defense, intelligence and homeland security communities as well as commercial, federal/civil, state and local geospatial intelligence stakeholders. 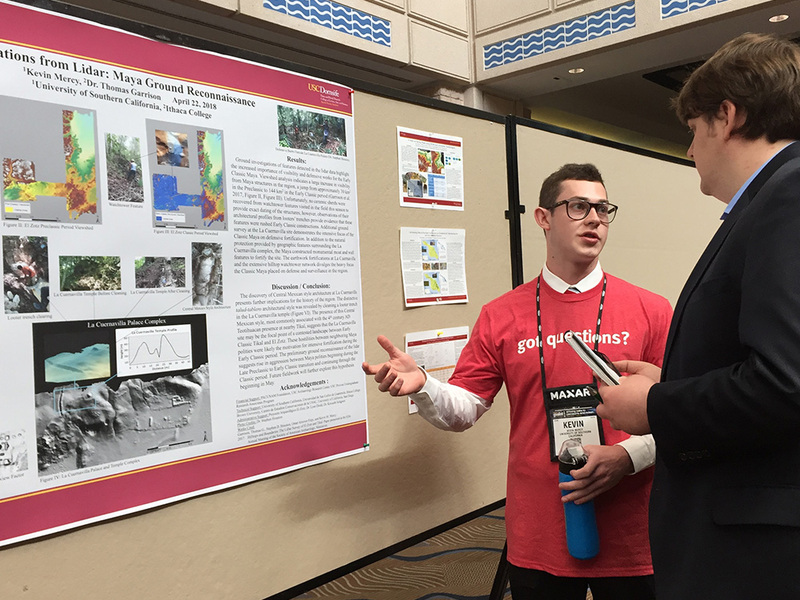 At the 2018 GEOINT Symposium in the Tampa Convention Center in Tampa, Florida from April 22 -25, not only did the representatives of the USC Spatial Sciences Institute “get GEOINT,” but GEOINTers got a lot USC Spatial, as well. 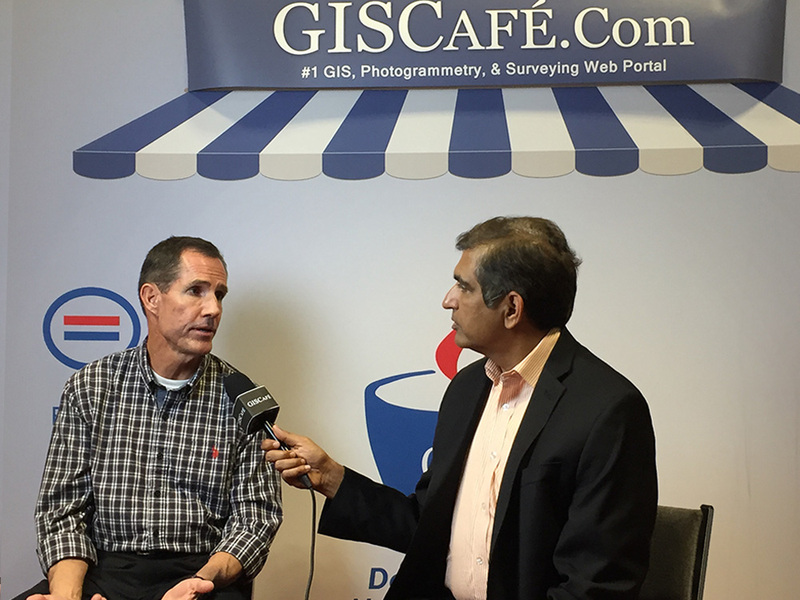 Fleming recaps his main stage remarks on GISCafé.com. To help build the future professional pipeline, Fleming also talked with Tampa area eighth-graders on the importance of STEM in their education as part of the USGIF commitment to k-12 education. 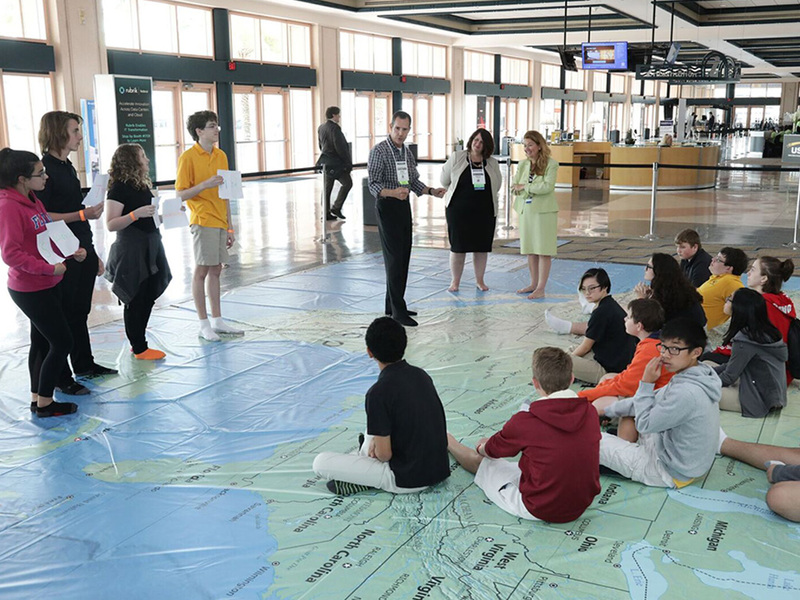 “Just by being here today, you are developing the capacity for curiosity about our physical world,” observed Fleming, as he stood on an interactive floor map of North America. “You’ll find math and the sciences, including the spatial sciences, will be important building blocks for your education ahead,” he advised. Using geospatial imaging and data analysis, a widespread team of which Mercy was a part identified more than 60,000 new sites that were previously undocumented (read the National Geographic article on this project). Archeologists using remote sensing and GIS technologies can develop “an overview of what is actually worthy of visiting and having attention in the field,” explained Mercy. Continuing his USC education in USC Spatial’s M.S. in Geographic Information Science and Technology Program, Mercy received a one-year USGIF individual membership as his prize. In addition to participating in the symposium poster competition, Mercy served as a GEOINT Symposium student assistant. In exchange for working with the Symposium event staff, student assistants receive complimentary symposium registration and the chance to engage with GEOINT professionals in a number of contexts. This year, the student assistants and other college students also learned how to use Hexagon’s Smart M.App platform to create an Incident Analyzer View—an interactive map displaying specific incident data. Students will display data using charts, graphs, gauges, and other tools while applying critical thinking and analysis skills. Mercy received the prize as the best mapmaker and will be featured in podcast following Hexagon’s 2018 HxGN LIVE event in Las Vegas this June. As a USGIF Golden Ticket young professional, Rich Windisch got to meet NGA Director Robert Cardillo with fellow Golden Ticket colleagues. (L-R) Rich Windisch, Dan Hausler, Ricky Rios, Robert Cardillo, Armando Drain, Josh Sisskind, Cadi Naquin, and James Urban. 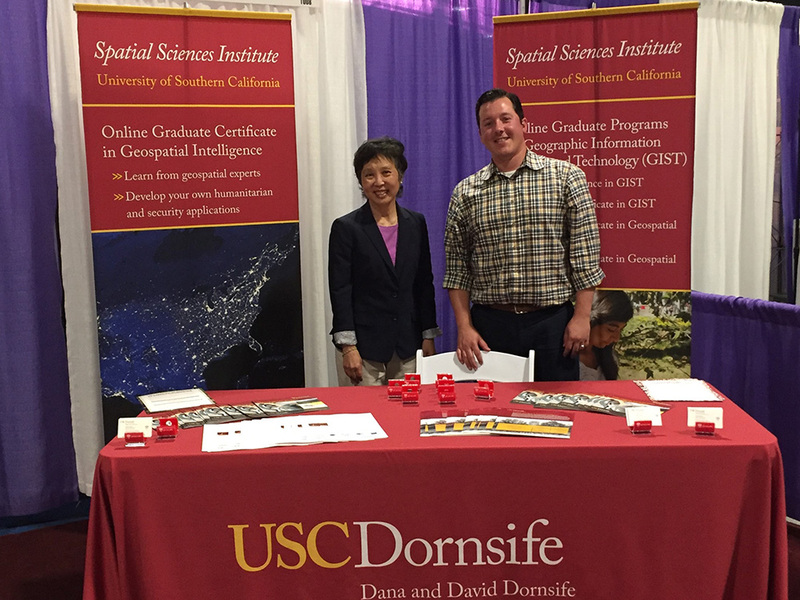 Helping USC Spatial connect with industry leaders for student internship and post-graduation job opportunities in the Exhibit Hall and throughout the symposium were USC Spatial Managing Director Susan Kamei and Academic Programs Director Ken Watson. 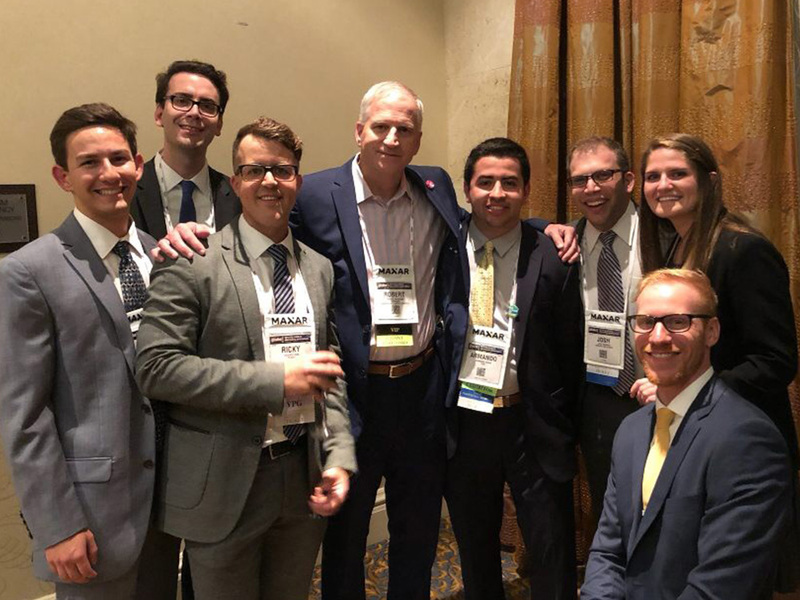 “An important part of what we do each year at the GEOINT Symposium is to meet with leaders from industry and the various IC agencies to learn what kind of geospatial professionals they are seeking to hire,” said Kamei. “We also have a great opportunity to share with the GEOINT community leaders the breadth and depth of our human security and geospatial intelligence academic programs and initiatives,” added Watson. 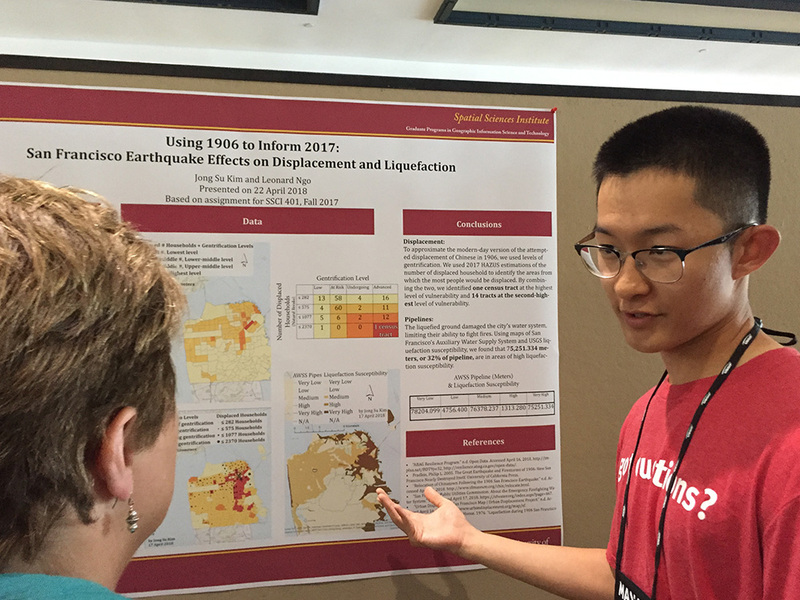 With Fleming, Kamei and Watson foster research collaborations for USC Spatial faculty with the organizations represented at the symposium. 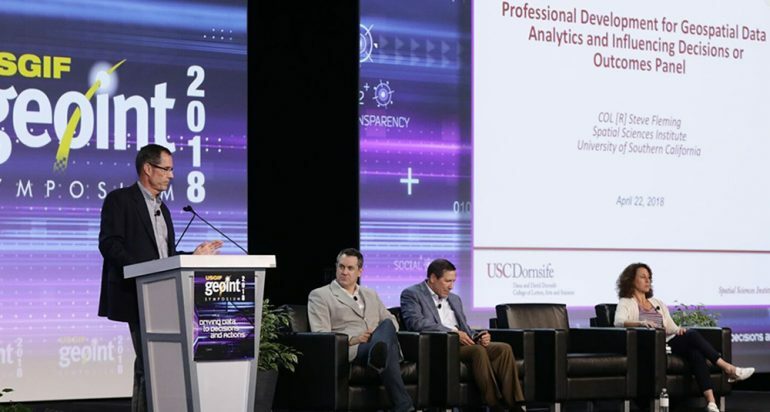 And as USC Spatial’s alumni ranks in the GEOINT world grows, symposium attendees can look for Fleming, Kamei, and Watson at the USC Spatial booth in the Academic Pavilion each year.